Weather: 13 - 30 knots. 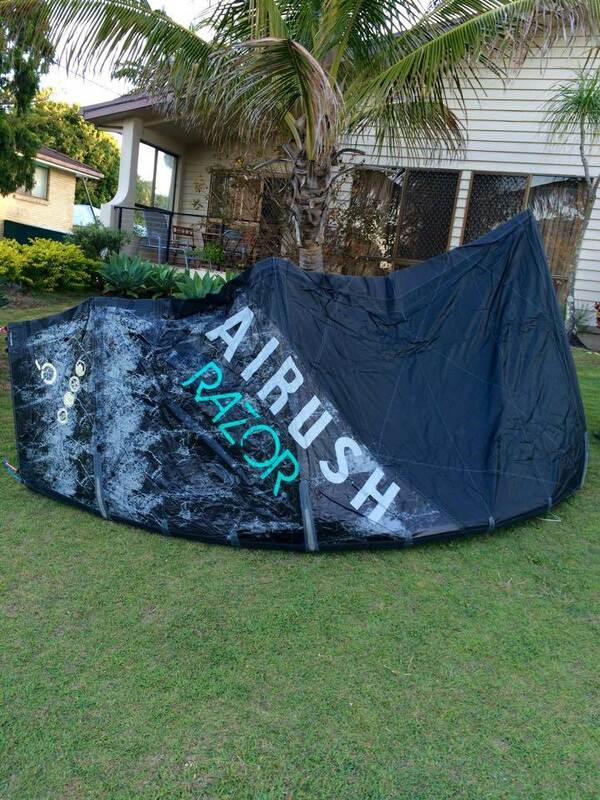 Disclosure: Airush team rider, Sunshine Coast Kitesurfing co shop rider. I've had the 2016 Airush Razor 9m and 11m for a few months now, i've finally been able to use them in most conditions so heres bit of a review for those interested in the kite. Unfortunately i was out for 12 months across the end of 2014 / start of 2015 season so i can't compare this model to the 2015 kite, but i rode the 2012-2014 razors before this and will try get some other riders on their input to compare the two. The Razor is a 5 line C kite, aimed for wake style, and freestyle, however i have also used it in the waves on a strapless surfboard on downwinders. For flat water, this kite does exactly as you would expect, good pop, good slack, and (in the 9m and 11m) stays relatively still throughout your trick. Out the bag, i found compared to previous years, that for the kite to keep fly forward you need to ride with the bar sheeted out atleast say 10cm, whereas on previous years i have gotten used to flying with the bar all the way in. I found shortening the fifth line around 15cm made the fifth go from slack to tight when riding and allowed the kite to continue flying forward without sheeting out, i would defiantly recommend trying this if your using this kite mainly for unhooking, this is also similar to how Alex Pastor tunes his kite, and makes a massive difference when unhooking. I ride the 11m on the fastest setting (light bar pressure) and the 9m on the slowest setting (heavy bar pressure), and found this setup made the kites an ideal speed for me to unhook with. The bar pressure on these kites is also relatively heavy compared to bow and delta shapes, though pretty similar to most C kites. With the fifth line shortened, unhooking on these kites is pretty damn good, and the difference is definately noticeable after riding hybrid C's and delta's, as the kite continues to fly forward when unhooked without having that power surge and back stalling that can be found with non c kites. Launching the kite is simple as long as you know how to use the fifth line, as it's much quicker than using the standard launch method on this kite. As with all 5 line c kites, you just need to pull a good foot of the middle line in until the kite rolls onto its back (when straight down wind), and grab an outside line to get the kite to the edge of the window. Using this kite in the surf is easily doable, I've done it often, whilst it's not going to be on the same level as a wave kite, I've found the 9m especially be pretty fun to muck around in the waves with, when unhooking, the kite drifts downwind good, however, hooked in i found it best to move the kite up i the window slightly to get it to start drifting. The Dyneema reinforcements across the canopy make the kite much less prone to stretching, which i think would make a pretty big difference after a few years in comparison to standard canopies. I've used these kites from 13ish knots with an outgoing tide (not quite enough to unhook or anything on the 11m - just mowing) upto 25-30 knots on the 9m, the unhooking range is pretty good I've found, larger than the 2014 models by a few knots for each size imo, the power can be turned off pretty easily as long as your still in control (i.e. still holding edge) by just sheeting out accordingly. The 9m is also a great kite for sending it when its to windy to unhook, the kite boosts nice and high if you send it correctly, but you need to keep flying it (with minimal input) to maintain float. So far my only concerns about the kite is the under the bar quick release, i find it's on the occasion it can be a bit to close to the bar when unhooking, and i've accidentally released it once when doing a flat three and must have had my thumb resting on it and released it whilst rotating, but thats only happened to me once and i wouldn't imagine would be an issue for 90% of riders. If you have any questions regarding the kite let me know, or if your around the Sunshine Coast your welcome to meet and check it out. given the longer chicken loop shouldnt the bar throw be much smaller/shorter? have you noticed this being a bit strange? also im very interested into knowing WHY there is no "dyneema load frame" on ALLLLLL the other canopy sports in the world. hanggliders kites paragliders speedwings basechoots parachutes microlights reserves sails ? the simular uses of it i have seen are in stupidly mega light webbing harnesses which are little more then a several lengths of meshed dynema belted around in a few loops. The5MetreKid, have you tried Razor 15m2? I only use the standard chicken loop, which i find the bar throw to be more than adequate, as i can reach the bar when fully sheeted out. The bar throw of the AP bar in comparison to the standard airush bar is also shorter, though i haven't noticed this when riding. The bar comes with both the standard and large chicken loops so if the large one limits your bar throw to much you can always go back to the standard one pretty easily. I've had a short ride on the 15m razor, in about 13 knots (very light conditions) with a strong tide. I can't comment to much on the kite due to having such a short session on it but i did still get to unhook a bit and get a feel for the kite. Firstly i noticed the kite pulls like a truck, and creates apparent wind easily (the tide would have helped with this) and once your moving you can pretty much leave it at 45 and the kite will keep pulling you. I found the kite didn't slack as well as my 11m, but still more than enough for passes, especially with the kite at 45 or below. I'll try get the owner to add some more comments as well.